Turkey is rich in protein, which means it contains high amounts of phosphorus. Phosphorus is important for strengthening bones and teeth as well as mineralizing them to protect against cavities. If you opt for ham, your mouth will still be happy. Eating just three ounces of ham provides 15 percent of your recommended daily zinc, helping replenish tissue along the gum line. But watch out for the sticky, sugary residue glazed ham can leave behind – be sure to swish with water or brush your teeth after. The green beans in green bean hotdish are a great source of vitamins A, C and K. Vitamins A and C are good for gum health, while vitamin K helps protect against substances that break down bones. Yams contain vitamins A and C, too. But if they’re prepared in a sweet, sticky sauce, they can leave cavity-causing sugars in your mouth. After enjoying candied yams, drink water to wash it away. 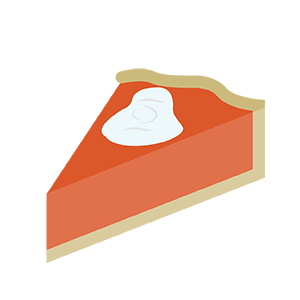 There’s nothing like a freshly-made pumpkin pie, and you might be surprised to learn that it can be good for your oral health, too! While pie typically has a lot of sugar, pumpkin provides a healthy dose of vitamin A to help strengthen enamel and encourage gum health. Plus, because pumpkins are already naturally sweet, pumpkin pie doesn’t require added sugars and can be made with spices.